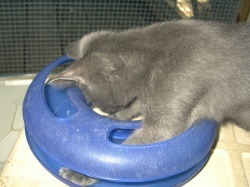 Finding the right cat toys: a process of paying attention! The question is, how did I turn out to be a person who has cats that make sculptures out of deconstructed cardboard boxes in the guest bedroom? I was a normal person ten years ago—I doted on my cats but wasn’t really very observant and certainly not very responsive to them. Often, they treated me and my belongings like toys. I wondered why they nibbled on my hair and played with my shoelaces, but didn’t think much about it, and I certainly didn’t respond by giving them more or better playthings. I was working in early childhood programs at the time, spending lots of time thinking about the very puzzling behavior of young children, and how to respond to these behaviors positively. That approach, part of The Creative Curriculum and other methods using developmentally appropriate practice, changed my life as an early educator. As one of my heroes in early education, James Hymes, once said, “First you have to KNOW the children!” Much later I realized I’d started using the same approaches with my cats and foster cats. It makes me seem eccentric, maybe, but it works. When I meet other people who have cats at home, I ask them, “What’s going on with your cats?” Their answers let me know that there are lots of other people who are struggling with finding meaningful work and play for their cat. We buy random toys that appeal to us, and are disappointed when they gather dust in a corner. The cats seem unconnected with the toys, and with us. We have been coexisting with cats, but not really LIVING with them. It’s time for that to change, and it can if we become better observers of our cats, and use our observations to make a better life for them.